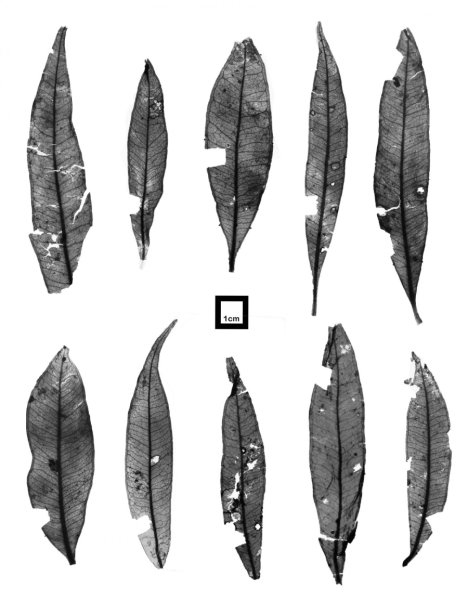 These are mummified Syzygium leaves discovered from the fossil-bearing sediments at Kiandra, NSW. Credit: Myall Tarran. Leaf fossils discovered high in Australia’s Snowy Mountains have revealed a past history of warmer rainforest vegetation and a lack of snow, in contrast with the alpine vegetation and winter snow-covered slopes of today. “The Lilly Pilly was a traditional food source for Aboriginal peoples and early European settlers and is still an important food source for many native animals and birds, as well as used for making cakes and jams,” says lead researcher Myall Tarran, PhD candidate in the University’s School of Biological Sciences. Mr Tarran says it’s possible the lack of snow was a result of continuing tectonic uplift, but higher atmospheric carbon dioxide levels were likely to have played a role.